Toyota Auris Hybrid driven | What Car? Its generally agreed that electrification is the next stage in the evolution of the car. The arguments start when it comes down to deciding the best way to go about it. Toyota favours a softly, softly approach, arguing that petrol-electric hybrids are the only logical option with current battery costs and technology. Whether you agree or not, you cant question the companys commitment to the cause. Toyota will have a hybrid power system in every model within 10 years, and the Auris HSD (the initials stand for Hybrid Synergy Drive) is the start of that programme. 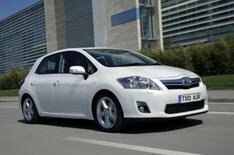 In effect, it combines the drive system from the Prius in the smaller but heavier hatchback shell of the Auris. Its whats known as a full hybrid, which for those unfamiliar with such things means it can cover short distances at town speeds on battery power alone, cruise using only its 1.8-litre petrol engine, and then make the two work together when you need strong acceleration. Combined, they deliver a maximum 134bhp. Every time you coast or brake, the battery is recharged ready for another short burst of electric-only driving. Drive goes to the front wheels through a continuously variable automatic transmission (CVT). Compared with that in a regular Auris, the suspension has been recalibrated to cope with the HSDs extra 105 kilos, the car sits a little lower and has revised bodywork to improve its aerodynamics, and there are unique trim features. To get the best from it, youll have to adopt a new driving style. Treat it like a conventional petrol or diesel car and its all a bit frustrating. The CVT saps power, so then it kicks down into a lower gear ratio and that makes the engine wheeze and whine: lots of fury, but very little action. Theres plenty of wind noise, too. Take a more relaxed approach and everything falls into place. Its smooth and near-silent, even when the petrol engine is operating. It all feels more coordinated. You get a great ride, too the suspension is better at dealing with speed humps and manhole covers than it is at helping the car corner quickly. Try to hustle the car and all you get is lots of tyre squeal and a reluctance to change direction. Anyway, thats not what the HSD is about. With a 10% company car tax rating, exemption from road tax and London congestion charging and a potential 74mpg, you can see where the priorities lie. Yes, its a bit expensive but have you seen the price of some diesels these days?